Staff Photo by Robin Rudd John Kelly (4) breaks loose for a long Tennessee touchdown run. The Tennessee Tech Golden Eagles visited the Tennessee Volunteers in NCAA football action at Neyland Stadium in Knoxville on November 5, 2016. KNOXVILLE — Tennessee's homecoming afternoon against Tennessee Tech went entirely as one would expect. The more important development for the rest of the Volunteers' season simultaneously happened more than 700 miles west of Neyland Stadium. 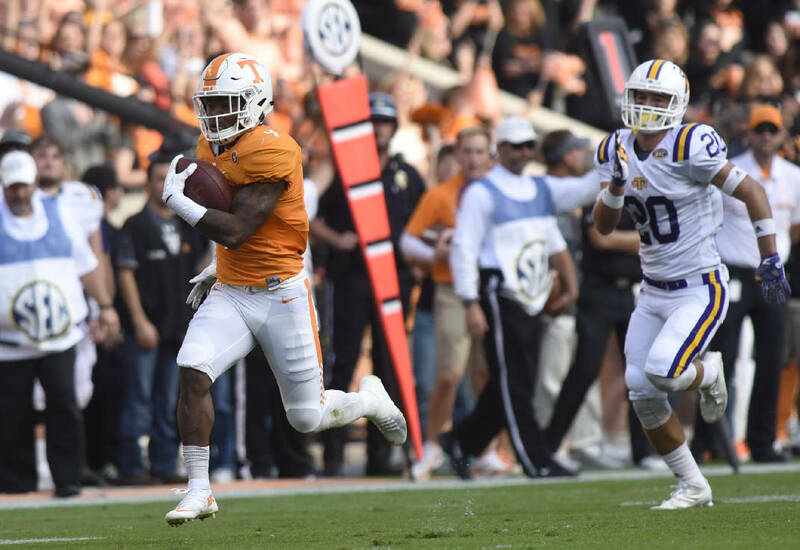 While Tennessee cruised past the Football Championship Subdivision's Golden Eagles with incredible ease in a 55-0 win, Arkansas was reviving the Vols' SEC East hopes with a 31-10 rout of division-leading Florida. "Everybody knows what needs to happen," defensive end Corey Vereen said, "so we just need to go out there and do it." The door remains open for the Vols to get to the SEC championship game. Had they not laid an egg in last week's debacle of a loss at South Carolina, the Vols (6-3) would have regained control of their own destiny in the division on Saturday. Yet with the Gators still facing a trip to LSU, Tennessee has reason to believe wins the next three weeks against Kentucky — which is also in the division race with only two conference losses — and Missouri at home and at Vanderbilt will get them to Atlanta. In the wake of a three-game losing streak, the swirl of negativity following the loss to the Gamecocks and star running back Jalen Hurd's departure, it was an unusual week for Tennessee, though coach Butch Jones downplayed the effect the alleged drama had on his team. "It was no drama at all inside the locker room," linebacker Cortez McDowell said. "Our biggest thing is ignoring the noise. That's what we did with the leadership we have on this team. It's also a byproduct of having an older team, because you can have guys grab young guys and help them throughout the whole thing. It all comes back down to leadership." Jones praised his players for their focus and how they prepared during the week and sensed their energy was in stark contrast to last week's lifeless performance long before kickoff on Saturday afternoon. "We have to be a team that plays with great passion and energy," he said. "We have to be a football team that prepares the way we prepared, and it was a mindset with our players. Our players were disappointed, obviously, as (was) everyone in our football organization of the outcome and our performance last week. "The great thing about sport is you get an opportunity again to prove yourself. I think everyone was very, very disappointed, and instead of feeling sorry for themselves, they came in with a mental focus and a mindset to get better and improve. I thought our energy was outstanding." According to cornerback Rashaan Gaulden, Jones had freshman Nigel Warrior, always one of the team's most animated players, give a presentation to the team about what was missing at South Carolina. "He recently presented a PowerPoint to the whole team a couple days ago," Gaulden explained, "talking about energy, passion, just being close to each other as far as fist-bumping, hand claps, all that stuff. He definitely provides a spark to our secondary with the way he comes down, fills the alley and tackles and just his energy. One of a handful of freshmen and young reserves to get extended action, Warrior led Tennessee with seven tackles. "He's an Energizer bunny type," Gaulden said. "He's going to bring his energy and different flavor to it, and obviously we're all invested into what he had to say." It's fair to wonder why the energy was missing at South Carolina, but it's not suprising the Vols were able to buck their trend of slow starts by jumping all over their overmatched visitors. Tennessee's first seven snaps on offense produced 191 yards and a 21-0 lead, and the hardest it got for Tennessee's defense was making two of its seven fourth-down stops inside its own 30-yard line in the first half against the Golden Eagles (3-6). 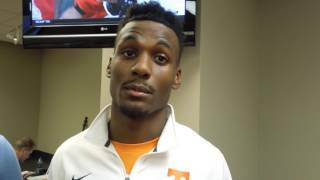 It was a feel-good performance and feel-good win the Vols needed after a bumpy few weeks, and Jones said the Vols enjoyed "one of the most spirited celebrations we've had in our locker room" after the game. "This has been a long time coming," running back John Kelly said. "We needed this win. We hadn't won in a while, and once we got to that locker room we were able to turn up and just enjoy each other's company." "We were fueled by the last three weeks," McDowell said. "Today was another opportunity for us to get back out there on the field and just have fun getting back to what we do and what we do best. "These next three games," he added, "are going to be huge for us." Contact Patrick Brown at pbrown@timesfreepress.com.